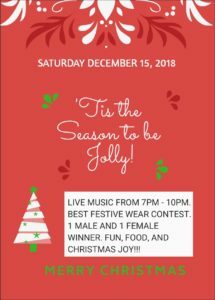 Post Christmas Party – Horace Orr Post 29, Inc.
We’ll host our Annual Christmas Party Saturday, December 15th 7:00 – 10:00pm. Entertainment will be provided by duo Jimmy Morrow and Steve Rollins with concentration on your favorite Holiday tunes. The Legion will provide meat platters. Please bring an appetizer, side dish, party snack and/or dessert to be shared by all.